For a fee. Free Friday 7.00pm-9:00pm. White. McKim was inspired, among other things, by Villa Medici, the architectural complex located on the Pincio Hill in Rome (1564-1580). Inside, the magnificent library room has walls over nine meters high covered with three levels of inlaid bronze and walnut bookcases. Two stairs hidden behind the bookcases at the corners of the room allow access to the balconies. The ceiling was decorated by Henry Siddons Mowbray and among the painted figures are Dante Alighieri, Sandro Botticelli, Michelangelo Buonarroti, Socrates, Galileo Galilei and Christopher Columbus. 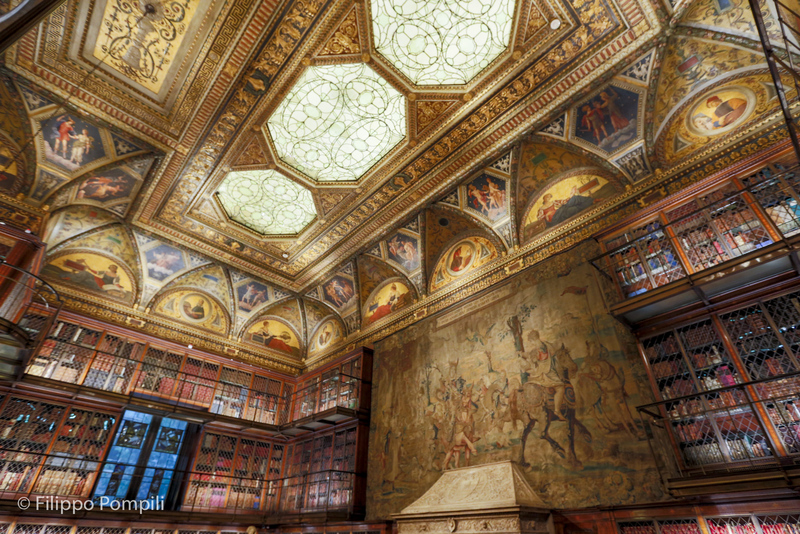 John Pierpont Morgan’s studio has an old Florentine wooden ceiling, adapted to the size of the room and decorated with Swiss windows and a marble fireplace. In 2006 a new building designed by Renzo Piano was built that integrates the three historical nucleuses into a single complex: the Morgan Library designed by McKim, the Annex building designed by Wistar Morris, and the house of the Morgans, dating back to the mid-nineteenth century. The collection includes paintings and art objects from the third millennium BC to the nineteenth century ranging from Egyptian art to paintings from the Italian and Nordic Renaissance school to Chinese porcelain. There are more than 20,000 works on paper such as ancient, modern and contemporary drawings and prints that make it one of the most important graphic collections in the world. Among the drawings are works by Leonardo da Vinci, Michelangelo, Raffaello, Rembrandt, Rubens, van Dyck, Degas, Van Gogh, Cézanne, Matisse and Picasso. The collection of manuscripts includes unique copies and first editions of great importance, such as numerous illuminated manuscripts, while among the prints there are as many as three copies of Gutenberg’s Bible. We also have modern documents, written and signed by historical figures such as Elizabeth I of England, Napoleon, Isaac Newton and Voltaire. There is also a collection of manuscripts and musical scores covering about six centuries of music history including original musical scores by Brahms, Chopin, Verdi, Debussy, Mozart, Schubert and Richard Strauss, early letters by Wolfgang Amadeus Mozart and the manuscript of Beethoven’s Violin Sonata No. 10, op. 96 in G major. Also part of the collection are the notes on which Bob Dylan wrote the songs “Blowin’ in the Wind” (1962) and “It Ain't Me Babe” (1964).